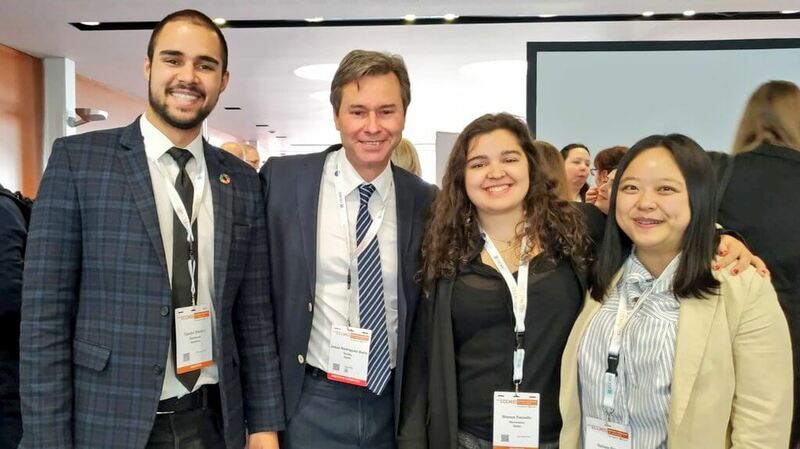 Between the 13th and 16th of April 2019, the International Federation of Medical Students’ Associations attended the 29th European Congress on Clinical Microbiology and Infectious Diseases (ECCMID), which took place in Amsterdam, Netherlands. Following the adoption of a Memorandum of Understanding with the Trainee Association of European Society of Clinical Microbiology and Infectious Diseases (TAE/ESCMID), this event was the first opportunity to translate the plans into action and increase the involvement of medical students. IFMSA was represented by a delegation composed of Teodor Cristian Blidaru (Liaison Officer To Students Organization, FASMR-Romania), and Sehee Rim (NMSA-Norway) and Blanca Paniello (AECS-Catalonia) as winners of a Scholarship provided by ESCMID and IFMSA in order to enhance youth participation in controlling the prevention and surveillance of communicable diseases. 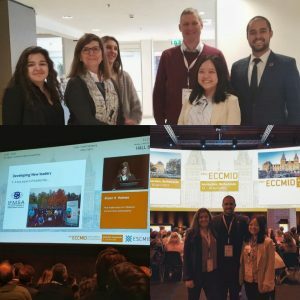 Bringing together more than 13.000 professionals in clinical microbiology and infectious diseases, ECCMID 2019 was the biggest and most relevant congress of its kind, attendees coming from over 125 countries. During the 5 days of the event, numerous lectures, roundtables, sessions and symposia took place, focusing on research, innovation and leadership. 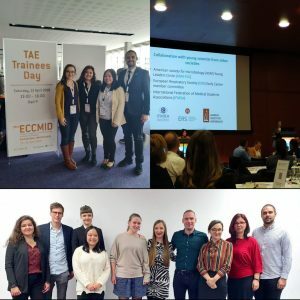 ECCMID has a special day for young professionals, called Trainee Association of ESCMID (TAE) day, which had its 10th birthday this year. TAE day performed as an arena where young professionals were given chances to meet the notable experts in the field of infectious diseases and clinical microbiology. In addition, young professionals got a chance to create networks with one another. Alongside IFMSA, several other organizations with subsidiary bodies for the youth were present, such as American Society for Microbiology (ASM) and European Respiratory Society (ERS). TAE day started with the history of TAE, inspirational talks from Young Investigators, a quiz for the team building activity and finally, round table sessions. IFMSA delegates sat on different tables and had chances to meet different experts and future academic colleagues. Discussions from the table went on freely, on everything related to the choices in career and life. It was a great opportunity to bring a students’ perspective, together with the already attending young professionals and ask questions about career path, workload as a physician or process of pursuing a PhD directly to the experts. ESCMID is exceptional as the society take the youth into account and nourish them with advice, research opportunities and various scholarships. A structure for young professionals, to work with and for youth, was an amazing idea and TAE is perfectly fulfilling its purpose. IFMSA was honored to attend this anniversary edition of TAE day and strongly hopes on a continuous development and strengthening of the collaboration with TAE/ESCMID, as a reliable and continuous student partner. Furthermore, during the 29th European Congress on Clinical Microbiology and Infectious Diseases (ECCMID), the IFMSA delegation attended several scientific sessions, workshops and lectures about different issues concerning infectious diseases and how they are becoming a real impact in the global health field. More specifically, some of the hot topics discussed were Antimicrobial Resistance (AMR) surveillance and stewardship, climate change & infectious diseases, vaccination coverage, outbreak control, emerging infectious diseases, among others. The topics ranged from the genetic, molecular diagnostics, use of metagenomics to actual governance of infectious diseases and clinical microbiology, which was fascinating and very diverse. Youth involvement is extremely relevant and important in all the aspects mentioned above and through our delegation we have tried to make the voice of medical students heard. During one of the symposia, IFMSA was even mentioned by Professor Alison Holmes as an example of leadership in Antimicrobial Resistance and youth involvement. In addition to that, IFMSA’s delegation had a productive meeting with ISID (International Society of Infectious Diseases) in order to talk about the potential projects where we could join our forces with and we also had the opportunity to share our ideas with our partners from EU-JAMRAI in regards to the One Health approach and its implementation in the National Action Plans (NAPs) of the European countries and not only. As a conclusion, we hope to strengthen our collaboration with ESCMID in the next years thus providing a new framework for meaningful students’ involvement in the field of clinical microbiology and infectious diseases.